Monthly, we focus on a different disability afflicting children in America and specifically in North Carolina. One of the most common genetic birth defects, affecting one out of every 691 babies, is Down Syndrome. Sometimes you know something about a disability, and sometimes you don’t. But, it seems most of us know someone with Down Syndrome. October is Down Syndrome Awareness Month. Researchers have yet to determine what causes the condition, but it’s statistically more common in children born to women over the age of 35. The babies are born with an extra chromosome; delays in physical and mental development are the side effects. According to the Mayo Clinic, screening for Down Syndrome is offered as a routine part of prenatal care. Although screening tests can only identify risk of carrying a baby with Down Syndrome, they can help you make decisions about more-specific diagnostic tests. Among the well-known signs of Down Syndrome are: short neck, with excess skin at the back of the neck; flattened facial profile and nose; wide, short hands with short fingers; and upward slanting eyes, often with a skin fold that comes out from the upper eyelid and covers the inner corner of the eye. It is important to note that while most children who suffer from the disease share these signs, children with Down Syndrome vary widely in their abilities. That is one of the goals for Down Syndrome Awareness Month. It’s less about celebrating disabilities, and more about celebrating abilities. Early intervention and good medical care make a big difference in the development of these children. For example, a young lady with Down Syndrome just last month walked the runway as a model at New York Fashion Week. Marian Avila, a 21-year-old Spanish model, said she “wanted to show the world that there are no barriers.” Also appearing at the fashion show were other models who have challenges, including Tae McKenzie of Charlotte, North Carolina, who is in a wheelchair. 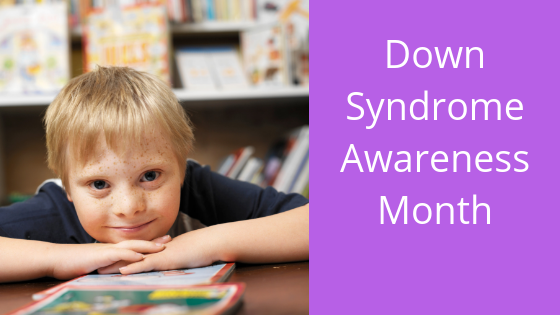 What can you do during Down Syndrome Awareness Month? Educate family members, neighbors, and social media followers by sharing stories or videos about Down Syndrome online. Volunteer for a committee or help with fundraisers for any of the above NC organizations. Do you have a family member with Down Syndrome and wish to share info with people in similar situations from around the world? The National Institute of Child Health and Human Development hosts a safe and secure registry known as NICHD-led DS-Connect®. The registry helps families and researchers identify similarities and differences in the physical and developmental symptoms of people with Down Syndrome. The hope is that these interactions will guide future Down Syndrome research across the globe, across America, and across North Carolina.